Photo by Armando Brown; originally published in the Orange County Register. This photo of John Wetton and Carl Palmer was taken at Club Nokia. Before catching Asia at Club Nokia on Friday night (Aug. 27) and then at the Grove of Anaheim on Saturday night (Aug. 28), I can't recall the last time I saw a major concert act play live two nights in a row. 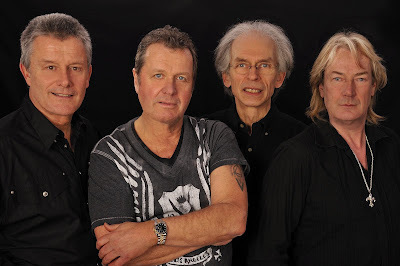 Although the quartet's set was almost identical both nights, there were plenty of great reasons to catch singer-bassist John Wetton, guitarist Steve Howe, drummer Carl Palmer and keyboardist Geoff Downes twice in two days. Firstly, the current version of the band features the original line-up and all four members are still at the top of their artistic powers. Although there are those who don't like prog-rock or melodic rock, Asia continues to be among the best-ever at crafting songs that are inventive, accessible and showcase virtuoso musicianship free of bombast. Secondly, Asia is touring in support of the second strong full-length album since its return in 2006. Phoenix was an unexpected surprise in 2008, and 2010's Omega makes it clear the band's return is a great one. In fact, many of the highlights of Asia's concerts this past weekend came from those recent releases. The band opened both shows with the uplifting and driving "I Believe," and also featured the powerful political opus "Holy War"and confessional "Through My Veins" in the first half of the set. The second half of the set saw the inclusion of "An Extraordinary Life," a joyous song that celebrates survival that is a highlight on Phoenix and proved to shine in the live setting too. A third thing to celebrate about both Asia shows was the audience. It has become the norm in recent years that a large number of concert-goers chat, yell over their cell phone while telling their pals that they are at so-and-so show, and are generally obnoxious. Both crowds were amazing, with just about everyone really listening to the musicians. What a concept: if you go to a concert, you actually care about the music. With ASIA currently on tour in support of the band's latest album Omega, I recently had the chance to speak with keyboardist Geoff Downes (on the far right of the photo) about the band's continuing journey, which includes an upcoming concert date at The Grove of Anaheim on Saturday night, Aug. 28, 2010. Robert: Hi Geoff, this is Robert Kinsler from the Orange County Register; how are you doing? I've been an ASIA fan since the early 1980s and it's a pleasure to speak with you. Geoff: You're an Orange County man. Robert: I am. I saw you play at the Long Beach Arena when your first album came out. 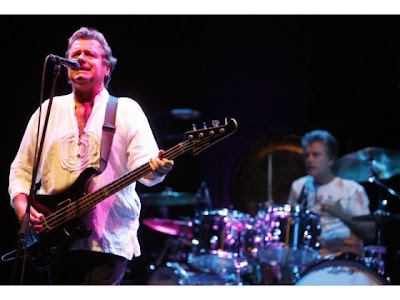 I thought we could start with how you and John (singer-bassist John Wetton) first work on the songs, and then how the rest of the band (guitarist Steve Howe and drummer Carl Palmer) work up the finished arrangements/recordings? Geoff: Well, we do a lot of trouble-shooting beforehand. I go over to John's (home) or he comes around to mine; we collate our ideas really like in the old days. We've done quite a number of albums together (both ASIA and their musical group Icon) - three Icon albums. We generally have a couple of musical ideas and we see which ones are going to work with what (other ideas) and then quite often we have similar ideas about the direction of the material; it's pretty much the way we worked back in the old days (ASIA was formed in 1981). He had a musical bit and I had a musical bit and then we put them together and then we'd see how that transpires and what it suggests lyrically. And then John starts to put his touches in the lyrical department and that's really how we get it to that sort of stage. We put a rough demo into a recorder, just a piano and then we take it to the other guys and that's really when we start to really hone into the arrangements. Robert: Do you arrange in the studio or or do you do pre-production including the final arrangements? Geoff: Generally, naturally, I've done a lot of pre-production. So I generally have all the songs - including the ones Steve has written with John or the ideas that Carl has put forward - I kind of do very rough computerized demos of what we have discussed so when we go into the studio obviously certain things don't work as well as we thought so we sort of chop it up (fine tune the song) around then. Robert: I'm thinking of "Holy War" - where you have that great instrumental break built around Carl's great drum solo with your keyboards that flow so well around that. Where does that chemistry come from; how all the parts of the song work so well together? Geoff:In that bit particularly - I think that's one of the songs that is one of the standout songs on the album - we didn't really have the idea of that with all the frantic drum parts that Carl came up with. That's not something you can do around the piano. 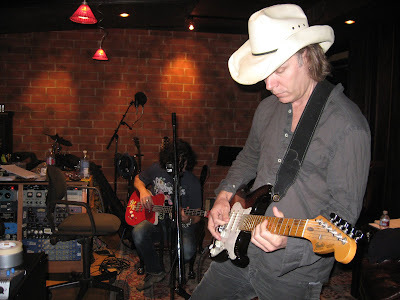 You can't conceive those kind of things will happen (in the demo stage) - the magic of something that Steve will put in a (guitar) line that will take it in another direction. So I think it's a constant kind of refining process as each person injects his bit into it. It takes on a whole different meaning; it's all about development. That's the great thing about working with the other three guys in ASIA. They're all great to work with and everyone has a common direction and a common goal. Robert: This celebrated lineup of ASIA has been together longer this time around since reforming in early 2006 than when you were initially together from 1981 to 1983. Geoff: Yeah, yeah. We've been together now nearly five years. It's pretty incredible really, because I think when we were first out we only did about three years from the inception of the band. So - as you know - Steve is off doing his bits and pieces with Yes and Carl doing some stuff with ELP (including an impressive recent reissue from Shout! Factory) and me and John have got our Icon project that we do, so it doesn't take totally center stage with everybody but I think once we do get together, everybody is 100 percent dedicated to it. Robert: Are you enjoying working together more now that that huge success at the beginning? Geoff: Yeah, I think so. That's something that will probably never be repeated (ASIA's self-titled album was the biggest-selling album of 1982. Released in March 1982, it sold four million copies in the U.S.) and I think that was a fantastic thing that came out of having these ideas around John's piano in Shepherd’s Bush in London and then all of a sudden six months later it was on every single radio station in America and you can't turn on the radio and not hear one of those songs. Some bands have that more than once in a lifetime, but for us, it was very much that period and those first couple of albums (1982's "Asia," 1983's "Alpha") were very successful. In some ways, that was not good for us because we started so high up - that first album was so enormous - that we never really had a chance to build the concept of the band at that point, and I think that's one of the reasons why we did get back together again five years ago is that we felt like we still had a lot to put forward and a lot to offer that we hadn't actually achieved before. Robert: I think you've done that with Phoenix and Omega. And you've done that, despite setbacks such as when John had his health scare where he had heart surgery in late 2007. Geoff: That's right, and Carl had a bit of a scare as well. None of us are getting any younger, that's for sure. I think the fact that the original band is still wanting to do it - next year will be 30 years since the inception of the band - that's not a bad go considering so many bands fall by the wayside. Robert: I'm thinking the songs you are doing now are every bit as good as your early material. Not just "Holy War," but "I Believe" and "Through My Veins." Not just the musical textures - the songs are so good too. Geoff: That's something we've always tried to attain, you know. I think songwriting has been the key to ASIA's success initially. I think it was a combination of having the songs we did (this part of Geoff's response was garbled from traffic noise where he was speaking on a cell phone while in the U.K.), the arrangements and musicianship that goes with it...each person was his own individual performer in his own right as well as collectively having the style of ASIA. You look at John's background and Steve's background and Carl's background - they were very much from the big English prog-rock arrangements. I think when we had the opportunity to do ASIA, it was very much a condensed version of that. We still had the musicianship, but it was supporting quite melodic and accessible rock songs. 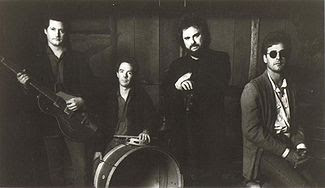 The Call in 1990, from left to right: Tom Ferrier, Scott Musick, Michael Been, and Jim Goodwin. I was just preparing a post on several John Lennon-related news items (Lennon would have turned 70 this coming October 9), when I saw a news release in my inbox early this morning that Call singer-songwriter Michael Been has just died. I am floored. I was a long-time fan of the Call. I can remember back in the mid-1980s when I delivered a paper route, I used to drive around in the middle of the night cranking up the band's epic album Reconciled, a 1986 release I consider to be one of the best albums of that decade. I saw the band perform at The Coach House in 1990 when the band was on its Red Moon tour and it was an incredible show. If my memory serves me well, the show that I attended ended up as the band's live disc Live Under the Red Moon released in October 2000. My prayers go out to the friends and family of Michael Been. Here is the release and I'll be playing lots of Call this weekend for sure. LOS ANGELES, CA - August, 19, 2010 - Michael Been, vocalist and guitarist of '80s band The Call, and father of Black Rebel Motorcycle Club's Robert Been, passed away today in Belgium, after suffering a heart attack backstage. Been was on tour with Black Rebel Motorcycle Club, acting as their sound engineer. He was 60. The Call erupted on the scene with a passionate sound and a strong political message, and earned numerous hits, including "The Walls Came Down," "I Still Believe (Great Design)" and "Let the Day Begin," which climbed to #1 on the Rock chart. Their fans included Peter Gabriel, Robbie Robertson, and Bono, all contributing to albums, and Gabriel deeming them "the future of American music." Been was not only the father of Robert Been but a significant part of BRMC's development. Often referenced as their fourth member, Been spent countless hours in the studio acting in many roles from mentor and guide, to helping the now internationally revered band capture their sound to tape. 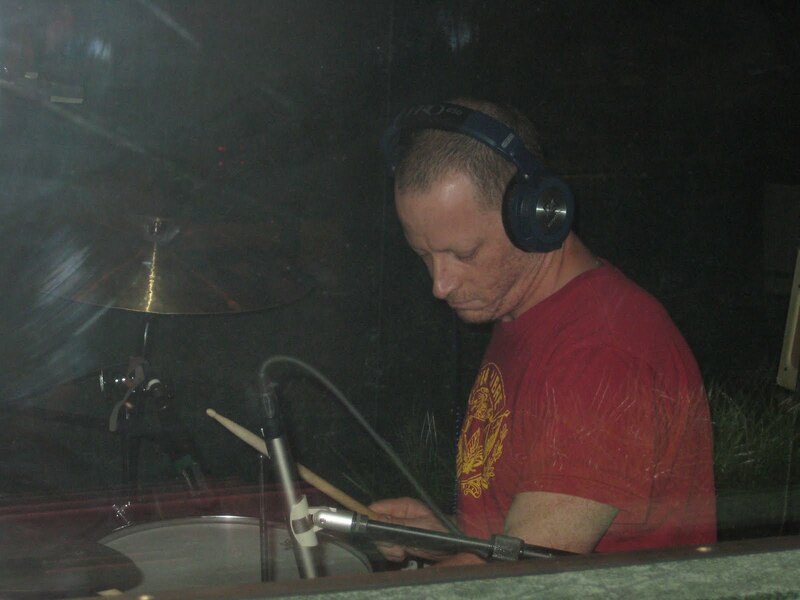 He acted as co-producer and engineer on numerous BRMC albums and was their loyal sound engineer for as many years. Singer-songwriter John Mellencamp is not one to sing his own praises. “I had to learn to write songs while I was making records,” Mellencamp said during the special “American Express presents An Evening with John Mellencamp” program at the Grammy Museum in Los Angeles on Tuesday night, Aug. 17. The special discussion and mini-concert was held on the release date of No Better Than This, the celebrated Hoosier’s latest album. Mellencamp, 58, noted that when he got signed to his first record deal in the 1970s, he was emerging at the same time as talented artists such as Tom Petty and Steve Forbert. “I was the low hanging fruit,” he mused. Much has changed since Mellencamp was forced to go by the moniker John Cougar with the release of his commercial debut Chestnut Street Incident in 1976. He has gone on to release discs such as Scarecrow (1985), Whenever We Wanted (1991), Human Wheels (1993), and Life, Death, Love and Freedom (2008), recognized as some of the best albums of the modern rock era. His just-issued No Better Than This marks another high mark in Mellencamp’s continuing journey to document his own life and that of the world around him – particularly those hit hardest by economic hardship, isolation and racial discrimination. “I’m 58 – almost 59. I am not the guy who wrote ‘Hurts So Good’ (off of 1982’s American Fool album). It would be folly for me to do that (song now),” he told interviewer Robert Santelli, executive director of the Grammy Museum. Like Neil Young and Bruce Springsteen, Mellencamp has been able to mature through life and make music that reflects that passage. No Better Than This is truly another leap forward for Mellencamp. The new disc, produced by T Bone Burnett, was recorded in three historic locations in the South: Savannah’s First African Baptist Church, Sun Studio in Memphis (used by Johnny Cash, Carl Perkins and Elvis Presley in the 1950s) and Room 414 of San Antonio’s Gunter Hotel where Robert Johnson recorded seminal blues tracks in the 1930s. The Burnett-produced sessions were recorded using a single vintage microphone and a 55-year-old AMPEX 601 mono tape recorder. 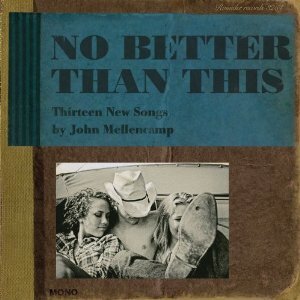 No Better Than This explodes with Mellencamp’s original songs incorporating country-styled blues, early folk and tinges of rockabilly and gospel. This isn’t music for the masses, but it is truly music that matters. “The problem with music today is there is no moment to capture anymore,” Mellencamp said of the retro-approach to recording his new album, noting this was a project on the opposite side of the “fix it in the mix” mentality. Musicians joining Mellencamp on the recording include Michael Wanchic (guitar), Miriam Sturm (violin), John Gunnell (bass), Dane Clark (drums), Troye Kinnett (accordion, keyboards) and Andy York (the guitarist who joined Mellencamp on stage at the Grammy Museum). “It was fun to be a musician playing music once again,” Mellencamp said of the 13 songs recorded in a mere 13 days. After more than an hour of discussion, and taking a few questions from the 200-person audience seated inside the intimate Clive Davis Theater, Mellencamp went through an acoustic-styled set of original material. Opening with the first track on his new disc, the uplifting “Save Some Time to Dream,” he was cheered on when he briefly struggled to find the right chords on his acoustic guitar. But the rest of his brief set was flawless, including a stirring acappella version of “Cherry Bomb” boasting his authentic vocals and the tender acoustic ballad “Thinking About You” (one of the highlights on his new album). He closed with a reflective “Small Town,” a song that showcases Mellencamp’s life-long love of his native rural Indiana. He also promised those coming to see him open for Bob Dylan on Aug. 19 in nearby Ontario would see a performance stretching more than an hour. dada features guitarist-singer Michael Gurley (pictured below), bassist-singer Joie Calio (on the right, standing on a dinner table) and drummer-singer Phil Leavitt. 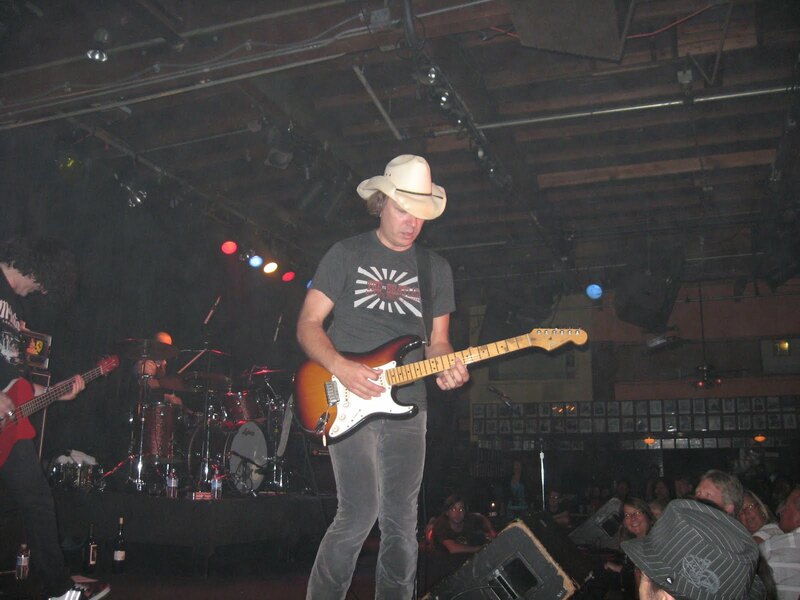 There was nothing unlucky about dada's sold-out show at The Coach House on Friday night, August 13th. In fact, even the the two opening acts were pretty good. But back to dada. The outstanding trio didn't take the stage until 10:10 p.m., but proceeded to play a concert just under two and a half hours featuring long-time fan favorites and new tracks that are set to be included on a forthcoming album. When I meet people and they discover I am a music writer, they often ask "Who do you like?" After I rattle off the obvious choices (The Beatles, Neil Young, John Mellencamp, etc. ), I always note "dada." Friday night's show reminded me why dada continues to rate as one of my favorite all-time rock outfits. The band (singer-guitarist Michael Gurley, singer-bassist-guitarist Joie Calio and drummer-singer Phil Leavitt) challenge listeners and celebrate rock 'n' roll with songs that are original and accessible whether heard on their excellent studio recordings or when presented in concert. The mix of dazzling songcraft, creative harmonies and extended musical jams that never became self-indulgent brought life to familiar material ("Dim," "Dizz Knee Land," "Dorina," "I Get High"), and likewise made the new songs so effective. Both "Mercury Down" (highlighted by inventive harmonies and Leavitt's Keith Moon-styled drumming) and a song with the likely title of “I Need a Moment in the Sun" were every bit as great as dada's classic material from the '90s and early '00s. "Ask the Dust" was one of the most epic tracks played, with Gurley performing a guitar solo utilizing the timeless melody from the Fab Four's "Eleanor Rigby" into the song. 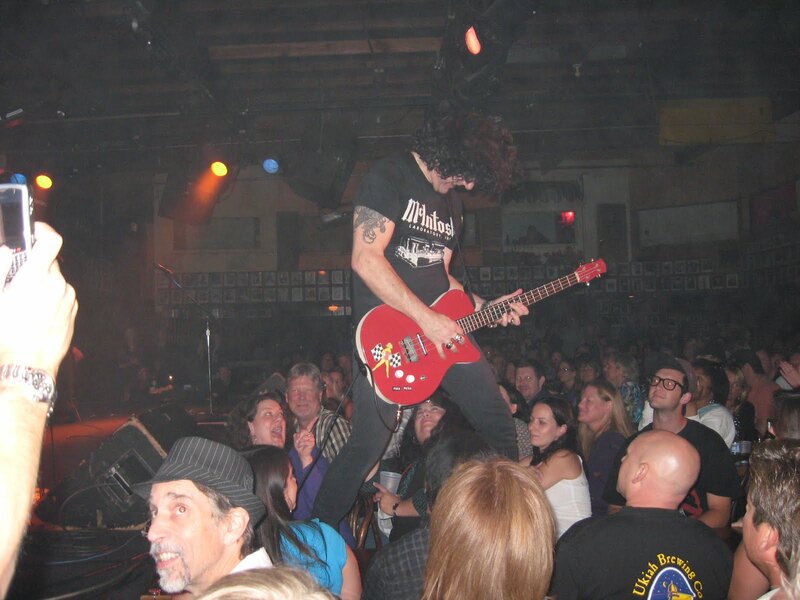 Several times throughout the show, the band members thanked the audience and noted how much they love performing at the Coach House. "I love playing with these two guys," Gurley said before the band peformed a mind-blowing cover of the Mamas and the Papas' 1966 hit "California Dreamin." And later, after returning to the stage for the first of two encores, Gurley summed up a magical night: "I wish every Friday night could be like this." I think he was speaking for every fan in the packed crowd. When Coach House shows stretch past 12:30 a.m., there are invariably a good number of concertgoers who head for home early. But dada fans mostly stayed and for good reason; these shows are the reason we fell in love with rock in the first place. Both of the openers did a good job and seemed to respond to the capacity, music-minded crowd. While Groove Kitty played 45 minutes of covers, they did ultimately come off like a better-than-average bar band. However, the original music band Hobs Row was very good. Anchored by singer-songwriter-keyboardist Nic Gibbs, the group's sound is in the territory of The Fray and Jamie Cullum. Based on the 30 or so minutes that Hobs Row played on Friday night, this is definitely a group with the talent and songs to go far. This month SMITHSONIAN CHANNEL gets in tune with INSIDE THE MUSIC, a series of specials that tell stories about the music and musicians that have had an enormous impact on some of the most listened to sounds of our time. In 1960, Klaus Voormann met The Beatles, who at the time were completely unknown, in Hamburg, Germany, where he was an art student. Three years later, when Klaus moved to London and lived with George Harrison and Ringo Starr in their apartment, The Beatles had already become the embodiment of a new youth culture. In 1965, Voormann, who was working as a graphic designer at the time, was asked by John Lennon to create the album cover for their latest album. The highly influential piece of cover art for Revolver, earned Klaus a Grammy Award. That same year, he became the bassist for the Manfred Mann Band and, in 1969 for John Lennon's Plastic Ono Band. Klaus Voormann was on the frontlines of the pop era's meteoric rise and played on all the Beatles’ solo albums. Smithsonian Networks (SNI/SI Networks L.L.C.) is a joint venture between Showtime Networks Inc. and the Smithsonian Institution, formed to create channels featuring programs largely inspired by the assets of the Smithsonian Institution, the world’s largest museum complex. Smithsonian Channel features award-winning original documentaries, series, and groundbreaking programs highlighting America’s historical, cultural and scientific heritage. Smithsonian Channel brings the American experience home in high definition and Dolby Digital 5.1 and is currently available to customers of DirecTV, Time Warner Cable, Charter Communications, Cablevision, Verizon, AT&T, and more. Learn more at www.smithsonianchannel.com. 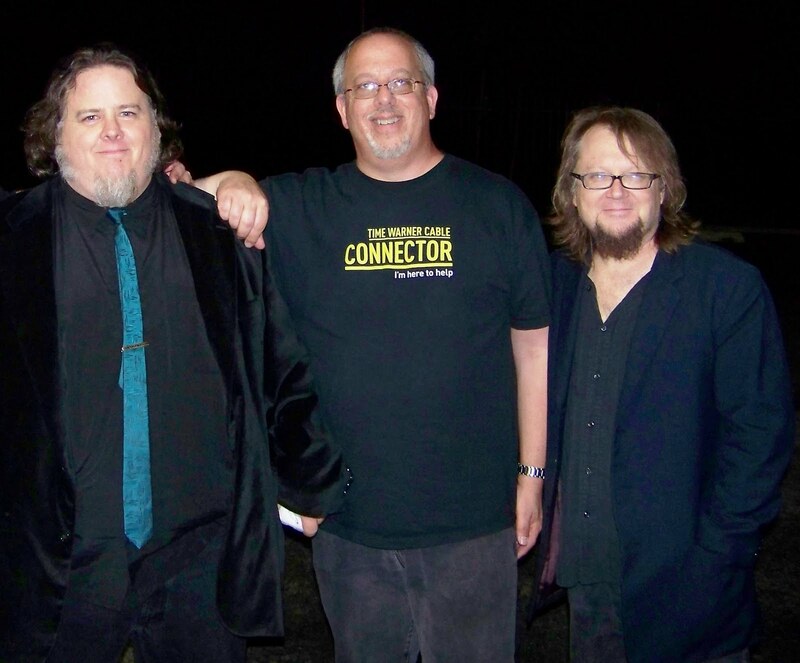 The Popdudes, from left, features Mike Simmons, John Borack and Robbie Rist. The band will perform at the Orange County Fair on Sunday morning, Aug. 15 as part of the Rock on the Road Tour. For fans of power pop who missed the arrival of the 13th annual International Pop Overthrow (better known as “IPO”) in late July and early August, there is an alternative to waiting until 2011 to catch many of the celebrated artists who performed as part of the event. The Rock on the Road Tour is coming to Orange County for two dates this weekend, including a 21 & over-only 8 p.m. show at Fitzgerald’s in Huntington Beach on Aug. 13 and an all ages bill set for the final day of the Orange County Fair, playing out from 10:30 a.m. to 4:10 p.m. on Aug. 15. Featured artists at the Friday night stop include Anny Celsi and Nelson Bragg, as well as singer-songwriter Adam Marsland (of Cockeyed Ghost fame). The OC Fair show will feature Maple Mars, Sparkle*Jets UK, Nushu and Dave Stephens. Orange County’s own Walter Clevenger & the Dairy Kings will close out each of the bills. Organized by Adam Waltemire, the host of the popular online Pop Garden Radio show, Fountain Valley John Borack was approached about helping organize the Orange County dates. Borack, who is both a music writer (Goldmine magazine, Garden Grove Journal) and drummer, was surprised when Waltemire asked if Borack’s Popdudes would appear on the OC Fair bill. And while Borack loves to perform, he is just as excited to see many of the other artists on both bills. In addition, the newly-issued “The Rock on the Road Tour: Season 1” 18-track CD will be sold for only $5 at both dates. The collection boasts unreleased material from all three Orange County acts on the set (the Popdudes, Walter Clevenger & the Dairy Kings, Sparkle*Jets UK) and features recordings from many other artists playing this weekend. For a complete line-up of artists and details about the upcoming Rock on the Road concerts, visit www.therockontheroadtour.com. Beginning Monday, Aug 16, rock legend John Mellencamp will perform each night for a week on PBS’ “Tavis Smiley,” sharing an exclusive preview of his new album No Better Than This with “Smiley” viewers. Mellencamp will also sit down with fellow Hoosier Tavis to explain his musical journey and why he decided to emphasize traditional American folk, country and blues on the album. Check your local listings for air times. 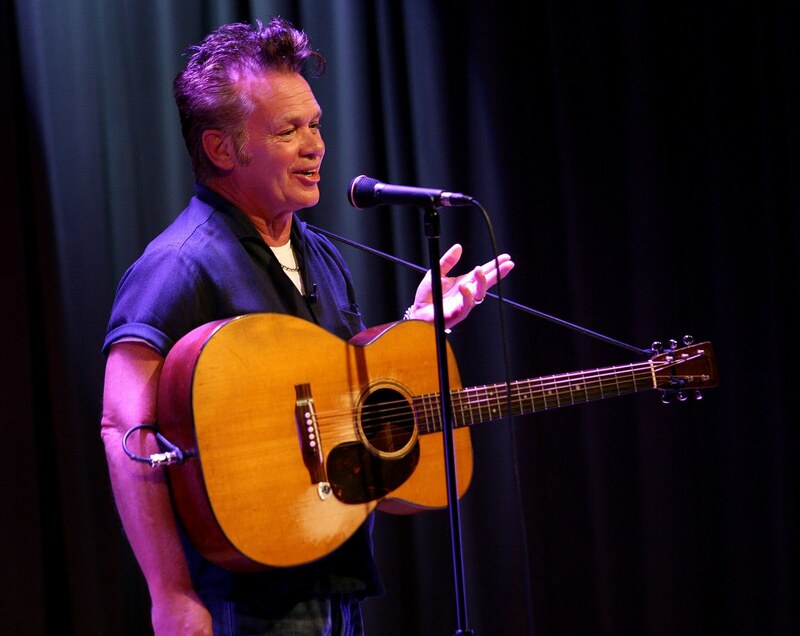 In a Tavis Smiley “first” from Aug 16 – 20, 2010, Mellencamp will close each show with a new song. Mellencamp is currently on a 12-city, limited engagement tour to promote his most recent album, and “Smiley” viewers will have a rare opportunity to witness live performances of tracks from the album. The official first leg of the “No Better Than This” tour will kick off at Indiana University , Smiley’s alma mater, October 29, 2010. The album was recorded on vintage equipment – a 55 year-old Ampex tape recorder with just one microphone — in Savannah at the First African Baptist Church, in Memphis at Sun Studios, and in San Antonio in room 414 of the Gunter Hotel. John Mellencamp is a Grammy Award-winning American rock singer-songwriter, musician, painter and occasional actor known for his catchy, populist brand of heartland rock. He is slated to receive a lifetime achievement award from the Americana Music Association this fall and was inducted into the Rock and Roll Hall of Fame in 2008. Over the span of his career Mellencamp has sold over 40 million albums worldwide and has amassed 22 Top 40 hits in the United States . He also holds the record for the most tracks by a solo artist to hit number-one on the Hot Mainstream Rock Tracks chart. Mellencamp is one of the founding members of Farm Aid, an organization designed to raise awareness about the loss of family farms and to raise funds to keep farm families on their land. Farm Aid celebrates its 25th anniversary this year. Mellencamp lives in Indiana with his family. TAVIS SMILEY is produced by The Smiley Group, Inc. / TS Media, Inc. in association with KCET/ Los Angeles . Major funding is provided by Walmart and Nationwide Insurance. Additional support comes from PBS and a one-time seed grant from the National Black Programming Consortium. The 30-minute program airs weeknights on PBS. To get local listings and to watch past episodes, please visit www.pbs.org/tavis. This is a longer version of the dada preview published on The Orange County Register Web site earlier today. I took these photos of dada in the recording studio on Thursday night, July 1, 2010.
dada is the rare band that combines stunning songwriting and inventive harmonies with virtuoso musicianship, and also delivers concerts that seemingly outdistance their flawless studio efforts. Since emerging on the music scene in 1992 with their successful commercial debut album Puzzle (featuring radio favorites “Dizz Knee Land” and “Dim”), singer-guitarist Michael Gurley, singer-bassist Joie Calio and drummer Phil Leavitt have released five outstanding albums and built a reputation as one of rock’s most-consistently impressive concert acts. Those who haven’t witnessed dada in action can catch the trio at the Coach House in San Juan Capistrano on Friday night, Aug. 13. Although dada hasn’t released a full-length studio album since 2004’s How to be Found (although the five-song EP A Friend of Pat Robertson was issued in 2006) followers of the band will be happy to learn dada is back in the studio working on an as-of-yet untitled new studio album. The nearly-completed song “Mercury Down” is an epic and powerful track that continues to showcase dada’s undeniable blend of classic Beatles psychedelic rock and post-Nirvana alt rock sensibilities all mixed up with touches of jam rock, jazz, folk, alt-country and blues. “We don’t want to do anything less than an ‘Abbey Road’ from now on,” Calio told me in July, when dada made a rare invitation for this writer to visit them at producer Scott Gordon’s Santa Monica recording studio. Watching the trio work on new material – some of it nearly complete and other in a development phase – was thrilling and shed additional light on the band’s formidable talents. “We hope to get this (the recordings) done by the end of the year,” Leavitt explained. While Gurley and Leavitt live in the Los Angeles area, Calio calls the state of Washington home. So since February, Calio has been coming down for intensive one-week stints to work with the other guys on the new tracks. The breaks also allow the members to step away from the studio and then re-examine tracks a few weeks later with a fresh set of ears to see if they pass their high standards or are scrapped. “The songs are interesting; we are doing a lot of improvisation,” Leavitt said. Indeed, over the course of five hours or so that I spent at the studio, Calio completed his driving bass tracks for a new song (possible title “I Need a Moment in the Sun”) before the full trio suddenly shifted sonic gears and had Gordon begin recording several extended jams that could well develop into finished songs as the process goes forward. “By the end of the week, everybody is ready to go home,” said Leavitt, adding the marathon-length recording sessions routinely stretch out long after midnight. The Black Crowes (left to right) are Luther Dickinson, Rich Robinson, Adam MacDougall, Sven Pipien, Chris Robinson and Steve Gorman. Fans of the Black Crowes won’t want to miss the next episode of “Live from the Artists Den” that airs on Los Angeles’ KLCS-TV at 10 p.m. on Sunday night, Aug. 8. The episode was taped at the historic Lyric Theatre in the little town of Oxford, Mississippi in September 2009 and features the Black Crowes performing 10 songs; there are also several interview segments with singer Chris Robinson. 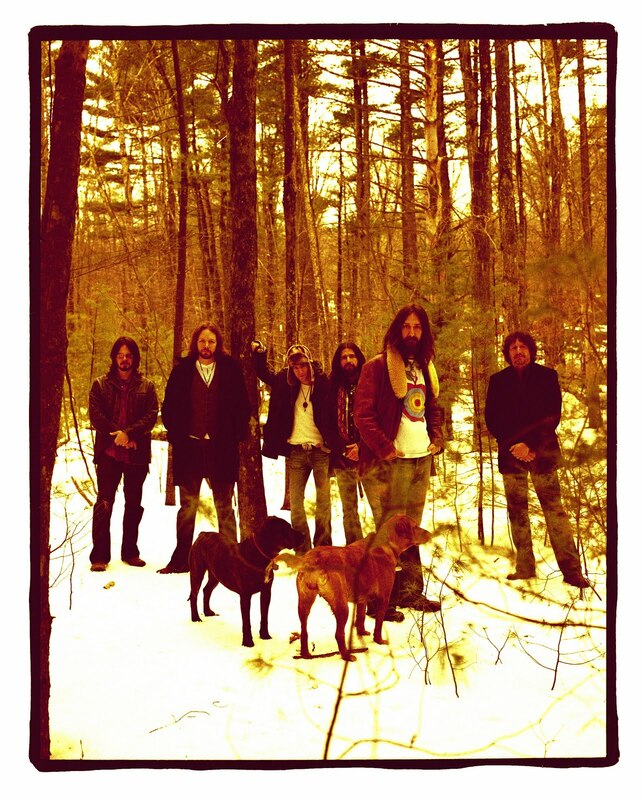 With the Black Crowes set to go on indefinite hiatus later this year after wrapping up their “Say Goodnight to the Bad Guys” tour, the band’s newly-issued double-disc Croweology (released Aug. 3 on Silver Arrow/Megaforce Records) is getting loads of attention. But the Crowes’ blend of blues, jam rock and psychedelic funk reaches its zenith in concert and this public television special does the troupe justice. Those simply looking for a greatest-hits trip with the Crowes will be disappointed, but discerning music lovers who admire the band’s deep catalog will appreciate the range of material offered up over the course of 60 minutes. The band plays Delta-styled blues (“Good Morning Captain,” “Let Me Share the Ride”), Southern blues-rock (a vocal harmonies-anchored “Shine Along”), tender folk-blues (“Appaloosa”), the Rolling Stones-styled ballad “She Talks to Angels” and genre-busting material (“I Ain’t Hiding” mixes up blues, psychedelic and funk effortlessly). Things close out with the band roaring through the retro rock ‘n’ roll of “Thick n’ Thin.” There are few modern-day bands that jam with the kind of raucous and rollicking abandon of the Crowes without losing control and falling off the rails. If you are a fan of the Black Crowes – or rock ‘n’ roll that celebrates the past and present – make sure to catch a great hour of music making courtesy of “Live from the Artists Den” on Sunday night.